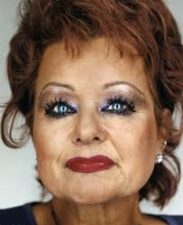 When Will Kristen Play Tammy Faye? When will Kristin Chenoweth’s Tammy Faye Bakker musical finally come to the stage? It’s still in the works, the actress says. In a recent interview on RuPaul: What’s the Tee?, a podcast hosted by RuPaul and Michelle Visage, Kristin Chenoweth provided an update on the development of her Tammy Faye Bakker project. She’s hinted at the work in progress both in a 2016 interview with the Hollywood Reporter and a 2017 BroadwayWorld interview. Bakker was famed as a Christian singer, evangelist, television personality, and businesswoman, the life of which Chenoweth would like to pay tribute to onstage. Kristen herself is an evangelical Christian, so this is probably a good fit for her. Can the Piemaker Heal Broken Bones? Who’s Dressing Kristin These Days?